In these clips the historians featured talk about what has most influenced and encouraged their development as teachers. 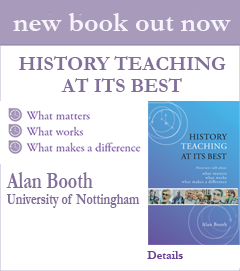 They reflect on a variety of influences from family and friends, to school teachers, colleagues and department and institutional ethos, and also students (and former students) and training courses and the literature on teaching history. Above all they emphasise that teaching is ‘a craft you can learn’ and that learning to teach goes on throughout the career, and this is a message underlined throughout the clips collection and reinforced in Advice to new teachers.